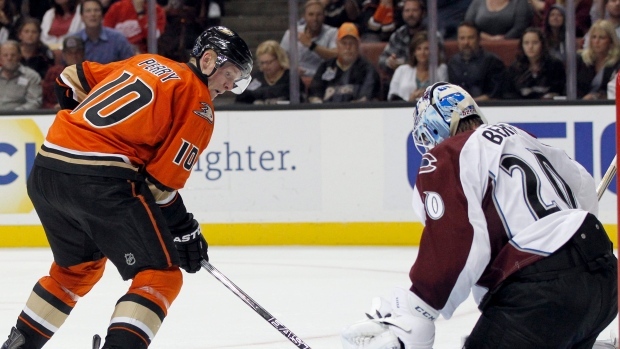 ANAHEIM, Calif. - The Colorado Avalanche's road opener erased the bad vibes from a blowout loss. Meanwhile, the Anaheim Ducks' season-opening nightmare just keeps getting longer and more unpleasant. Reto Berra made 35 saves for his second career shutout and Nathan MacKinnon scored in the opening minute of the Avalanche's 3-0 victory over the winless Ducks on Friday night. Jack Skille also scored for the Avalanche, who bounced back from a 6-2 loss to Boston with a comprehensive effort on both ends against an increasingly desperate opponent. Anaheim has scored just one goal all season, and Berra is the third goalie to shut out the Ducks already. "You expect them to be strong because they lost the last two games at home, and we were ready for that," Colorado coach Patrick Roy said. "We had to come out with a big performance, and I'm proud of them, because that was an (opponent) that was hungry." John Mitchell added an empty-net goal for the Avalanche. Berra made several big saves, but the Swiss netminder was backed by 41 blocked shots by his teammates as Colorado dropped the three-time defending Pacific Division champions to 0-3-1. "It feels good when the guys help you out like that," Berra said. "I was also lucky today, but for big wins like that, you need luck." Frederik Andersen stopped 22 shots for the Ducks, who haven't scored in more than 163 minutes since Sami Vatanen got their only goal against Vancouver on Monday. Anaheim, a popular pick to win it all this season after finishing one game short of the Stanley Cup Final last spring, hadn't lost four straight games to start a season since 2008-09. "From fans to players, there is no one in this organization that is happy right now," Anaheim coach Bruce Boudreau said. "But I did see signs of pulling out of it. I firmly believe if we get one goal, we'll get three or four, but right now it's just such a struggle to score. I've never seen it in my time coaching, and I can't remember it when I was playing, going four games without a forward scoring. It's happening all at once." The Ducks' problems have been numerous, including 91 straight shots without a goal and a power play that's 0 for 11, but the most surprising aspect is four scoreless games from Ryan Getzlaf and Corey Perry, their franchise cornerstones. "It's something that we haven't really gone through pretty much since I've been here, and it's tough," said Perry, who had never been held scoreless in a season's first four games. "It's going to break, and when it does, it's going to feel good." Colorado defenceman Francois Beauchemin received cheers and a few boos when he returned to Anaheim, his home for parts of nine of his first 10 NHL seasons. The Ducks gave him a brief scoreboard tribute in the second period, and Beauchemin acknowledged the cheers with a wave. "It's always fun to come back, and the video was really nice," Beauchemin said. "It's good to be with a great group of guys here. We've got a lot of skill." Beauchemin won the Stanley Cup with the Ducks in 2007. He left for a 1 1/2-year stint with Toronto, but returned for Anaheim's recent run of division titles. He left the club in free agency last off-season when general manager Bob Murray apparently wouldn't meet his desire for a three-year contract. MacKinnon flung an innocent-looking shot at the net 53 seconds in, and it somehow squeaked through Andersen for his second goal of the season. After the Avalanche trapped Anaheim's fourth line in its own end for a long stretch in the second period, Skille's long shot deflected off Tim Jackman's stick for his first goal since Feb. 9 with Columbus. NOTES: The Ducks unveiled their new third jerseys. The bright-orange sweater features the franchise's original goalie-mask-with-a-duck-bill Mighty Ducks crest, with the current crest on the shoulders and the current jerseys' letters and numerals. Anaheim added orange as a primary colour when Henry and Susan Samueli bought the team from Disney to emphasize its Orange County roots. ... Anaheim D Simon Despres incurred an upper-body injury before the third period. He appeared to get hit in the head on a check by Tyson Barrie.